Gals: What have been your favorite and least favorite bridesmaid outfits? Have you seen the new "Say Yes to the Dress: Bridesmaids" show? Oh my goodness, that show is driving me cray-cray-crazy. The girls on the show are selfish and controlling - and we aren't just talking about the occasional Bridezilla! There are bridesmaids on this show that I was horrified to discover are not only supposed to be the bride's friends, but some of her best friends. These girls are terrible, whether it's complaining about the dress styles, colors or price. Forget the bride and celebrating her day - they just want to look good. If it's not the 'maids, the brides on this show are being overly ridiculous in their expectations around the cost of being a part of their wedding. Ultimately, the brides look at being a bridesmaid as a privilege rather than an honor, and some 'maids see it all as doing the bride a favor instead of just doing it because they love their friend. Seriously?! Remember when I told you about my one of my BFF's wedding that was held over the Fourth of July weekend? Well, take a sneak peek (via the two of the paltry four pictures I managed to grab on my own camera ha!) of the fabulousness that was that weekend - no bad bridesmaid or Bridezilla juju here! To go along with our cute (and affordable!) 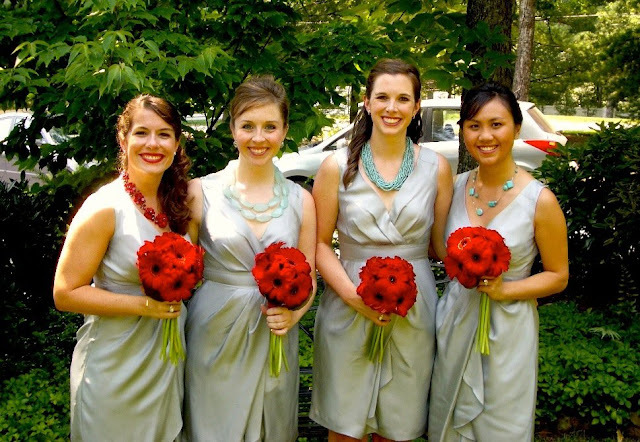 gray Banana Republic dresses, Annemarie selected red and Tiffany blue accents (so chicly patriotic for a July 3 date) with custom necklaces for each of the bridesmaids. She knows us all too well; I loved my chunky pale turquoise one! Matching our necklaces were adorable turquoise flower shoe clips to go on our neutral heels. 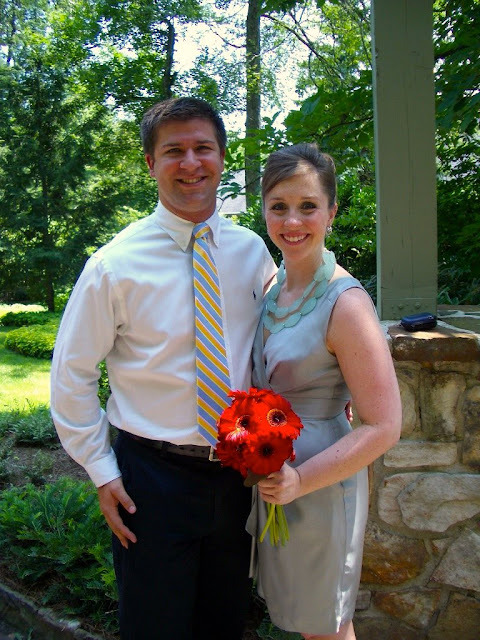 Leigh, the MOH on the left, had red flower clips to match her red necklace (and lipstick! Rock it, Leigh!). To finish off the wedding party look, the guys had on complimentary gray suits, turquoise ties and red flower boutonnieres. Combined with the decor at the church and reception, and we all looked pretty amazing together. Nice selections, AMC! Maybe you aren't as lucky as I have been to have friends with great style and even better senses of budget-friendly selections. Do you have a bridesmaid dress that you definitely won't "wear again?" Consider donating it to a girl in need. In the meantime, what do you think of the new "Bridesmaid" edition of the show? Realistic, or over-the-top made-for-TV drama? My best friend just got married and we were actually featured on this show...well at the end only (should be a 10 minute clip)....it is def a made-for-tv-drama...they literally force you to act dramatic for the camera! It is a ridiculous show...but quite entertaining! hey! random comment here...came to your blog from the bloggycon tag on twitter..seeing what i missed out on! i wanted to go but it just didn't happen. but i saw your blog title and hopped over because i'm from atlanta originally! love your blog. following! Natalie Catherine - So glad you stopped by, and thanks for following! I was at Bloggy with my client and it was great to meet everyone there. You should def try and go next year if you can!